Perfect for kids because there are no parts to assemble. Excellent flying kite right out of the bag. 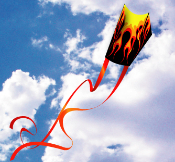 Super Easy to Fly Kite! !